Almost all marine fish reproduce through production of eggs that develop and hatch while exposed in some way to the marine environment. There are exceptions of course; a few live bearing telosts (bony fishes) like sea horses and brotulids and many elasmobranchs (sharks and rays) produce live young from internal incubation, but most marine fish practice external fertilization and even if the eggs are protected by the parents until hatch, the eggs are exposed to the marine aquatic environment. Marine waters have a considerably higher density than freshwater, and this provides some reproductive options that few freshwater have, basically, unless they are attached to something or contained in some way, the eggs of most marine fish will float. Some species produce eggs that contain an oil droplet that enhances the buoyancy of the eggs and use this option to disperse millions of eggs on the oceanic currents. Some species fight this inherent buoyancy andattach and/or protect the eggs until embryonic development is complete and the egg releases a competent larva able to swim and feed right after hatching. Thus because of the salinity of the sea, marine fish have been able to develop a wide variety of modes that adapt their eggs to the marine environment and ensure survival and dispersion of the young in ways best suited to survival of their species. This reproductive mode completely avoids a planktonic pelagic larval stage. The embryo develops in or on the egg until it breaks free as a post larva or juvenile and begins a benthic existence. This mode of reproduction is quite rare in marine fish. The toadfishes, Batrachoididae, are good examples of this reproductive mode. A great many small reef fish produce nests of small demersal eggs that hatch larvae in various stages of development with various amounts of nutritive yolk material. 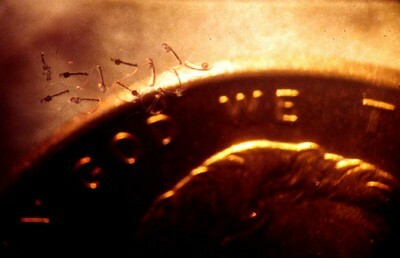 The yolk usually sustains the larvae for 12 to 18, sometimes 36 hours before feeding must begin. This allows time for final development of organ systems and movement of the larvae into the near surface, plankton rich, oceanic waters. These nests may contain only a few hundred eggs or many thousands of eggs and may be well hidden in holes or crevices deep in the reef or placed and guarded on openly exposed surfaces. Parental care of the nests until the eggs hatch is almost always present. Potential predation on these nests, especially those that are exposed to the open reef is always great. Clownfish and other damsels, dottybacks, grammas, gobies blennies, and triggerfish are among the reef fish that spawn demersal eggs. Mouth brooders that produce large postlarval or juvenile young that do not have a pelagic larval stage must have large eggs that carry enough nutritive yolk to support development of a large offspring. Avoidance of a pelagic larval stage greatly reduces early mortality but it also severely restricts the number of eggs that can be carried. Mouth brooders that carry the young entirely through early development and produce the post larval or juvenile form could also be considered as external brooders. Marine livebearers and external brooders such as the sharks, brotulids, and seahorses, do not technically fit into this category since they nurture their embryos internally or incubate their eggs differently, but they do produce benthic young, thus they also do not have a pelagic larval stage and share the advantages (high survival potential of individual offspring) and disadvantages of this category (few young, restricted distribution of progeny). Sea catfish (Ariidae), and the Banggaicardinalfish ( Pterapogon kaudemi, Apogonidae) are among the few marine fish that mouth brood large eggs and produce benthic young. Mouth brooding has the advantage, like pelagic spawning fish, of not having to prepare or guard a nest site, and also an advantage similar to the nest makers, of protection during the very vulnerable egg and early embryonic stages. Tiny toadfish, Opsanus beta, only about a week old sit on top of a large yolk sac that is attached to a piece of driftwood. This species produces demersal eggs that develop directly into benthic juveniles. A pair of tomato clowns, Amphiprion frenatus, with a large spawn, over a thousand eggs that will hatch into competent pelagic larva. 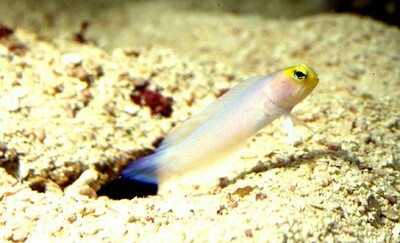 A yellow head jawfish, Ophistognathus aurifrons, a mouth brooding species hovers above his burrow. Mouth brooders that carry relatively small eggs that result in pelagic larvae have the advantages of a secure brooding method, production of a relatively large number of eggs per spawn, larvae that are well developed at hatching, and broad distribution of young in through dispersal in the plankton. The male is always the brooding parent in marine mouth brooders. Although the eggs are kept in the oral cavity of the male, they are still exposed to, and oxygenated by, the marine waters that pass through the mouth and gills of the male. Only the jawfishes (Opisotgnathidae) and the cardinalfishes (Aogonidae) are small egg, mouth brooding reef fish that produce pelagic larvae. By far the most common reproductive mode among tropical marine fish is the production of vast numbers of small, externally fertilized pelagic eggs that hatch small pelagic larvae. There is no parental care of the embryo, larvae or juvenile. Many species spawn on almost a daily basis during the optimum spawning periods of the year so a vast number of eggs are produced to make up for the lack of parental care. Large fish produce many eggs per spawn, perhaps over a million for the large groupers, while small fish such a the pigmy angels produce only 300 to 500 per spawn. The large French and Gray angelfish, Pomacanthus arcuatus and P. paru, produce 50,000 to 100,000 eggs per spawn. The larger the female, the more eggs she produces. Fecundity of a species, however, although strongly influenced by the production of an average female, is dependent on the number of females producing eggs. Thus a very abundant species of small fish can produce more eggs than a rarespecies of large fish. Typically, tropical pelagic eggs hatch in 20 to 24 hours after spawning, the prolarvae require about 72 hours to develop eyes, gut, and fins before beginning to feed. The larval stage extends from 21 to 40 days depending on species, temperature, available food and possibly a suitable environment for juvenile survival. 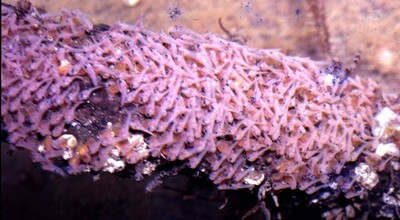 Settlement of the post larvae or juvenile may occur in a shallow nursery area or on or near the offshore reef environment. Angelfish, surgeonfish, parrotfish, groupers, moray eels, snappers, grunts, mullets, reef drums, porgies, wrasses, and many other species spawn pelagic eggs. Some species, scorpionfish, lionfish, frogfish and angler fish, produce pelagic eggs that are bound to each other in a dense gelatinous matrix, and others, flying fish, produce eggs that have long tendrils that catch around floating weed and debris and keep the egg afloat. These species essentially produce pelagic “demersal” eggs. The eggs are usually kept together in the raft or nest until hatching and then the larvae become pelagic and are dispersed by the currents. Production of gametes, eggs and sperm, is not a simple matter. It is biologically expensive and, of course, biologically necessary. The process of evolution, survival of a species, demands that each species gets the biggest “bang for it’s buck” that is possible, considering its evolutionary history and its current environment, morphology, and physiology. It would be prohibitively expensive for any species to simply shed eggs and sperm willy nilly and hope that the two get together some time for a drink and a pleasant evening. Even sessile species (organisms attached to place that can not move or have very limited powers of movement) that produce millions of gametes like oysters, clams and corals have elaborate timing (moon phases) and communication (pheromones) methods to insure that the gametes are released at the same time in the same areas, thus ensuring fertilization of many eggs. Mobile species, on the other hand, have to come together and coordinate the release of gametes. They have to be sure of many things before they can spare the expense of gamete release. A cup of coffee, a little small talk, and some slow dancing is absolutely essential, of course, but with fish we call it courtship and spawning. Note that spawning systems are interdependent and coadapted to all other aspects of the biology and behavior of the species. 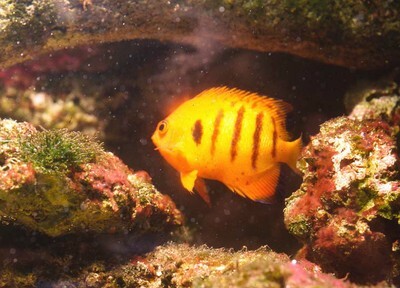 Small species that are adapted to specific sites by feeding behavior, such as cleaners, or are very territorial because of a relationship with another species, such as clownfish, or are dependent on reef cover for protection from predation such as dottybacks, tend to form pairs or small harems, while more mobile species, wrasses, tangs, snappers, and jacks, for example, more often spawn promiscuously from schools or in spawning aggregations. Different species, of course, have different adaptations to the same conditions, and there aremany exceptions and variations to our categorizations of spawning methods. According to Thresher (1984), however, there are five spawning systems for reef fish. The first is the long term pairing of a specific male and female, a monogamous mated pair. This is not a typical mating arrangement for marine fish, and the definition of monogamy depends on the meaning of “long term pairing.” Clownfish, for example, establish pairs that can remain intact for many years, while french and gray angelfish, Pomacanthus paru and arcuatus, according to my field observations, seem to form pairs that last for at least a few months, the spawning season, of each year. Some species of gobies, blennies, hawkfish, and rabbitfish also form stable pairs. The stability of these pairs in the wild is unknown, since long term observation in nature is, to say the least, rather difficult, but is certainly variable from species to species. 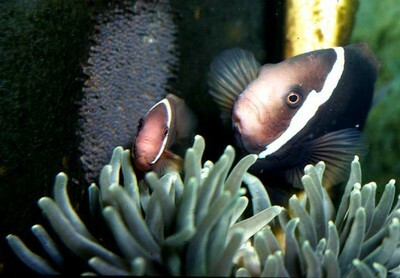 What happens on the reef may be very different from the behavior of a particular species in an aquarium, but the usual total lack of tolerance of another male or female, by a “mated pair” (particularly clownfish andgobies) in an aquarium argues strongly for similar monogamous behavior in the wild. The definition of “monogamy” in reference to reef fish, in my opinion, requires the repeated spawning of the same male and female, with exclusion of spawning with other males or females, for a prolonged period, probably at least an entire spawning season. Juvenile Banggai cardinalfish, Pterapogon kauderni, only a week since released from the mouth of the male parent, occupy the “spines” of an artificial sea urchin. The flame angel, Centropyge loriculus, one of the many pygmy angels that readily spawn tiny pelagic eggs in the small tanks of marine hobbyists. Harem spawning is the second type of spawning system. A single male spawns repeatedly with several females, perhaps up to dozen, and the entire harem occupies the same general area of the reef. The male protects his territory, and its resident females, from other males that may be passing through or that occupy adjacent territories. Angelfish in the genus Holocanthus commonly form spawning harems, one male rock beauty, H. tricolor, for example will be dominant and control an area of several hundred square feet of reef structure with 3 to 6 smaller females in residence. Some species that lay demersal eggs such as some damselfish, trigger fish and puffers form harems as do some pelagic egg producers such as angelfish, wrasses, and parrotfish. 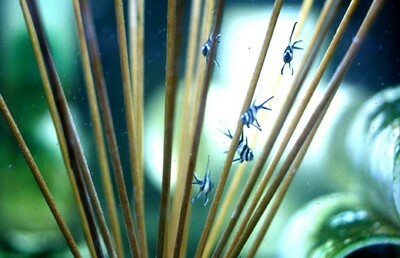 Sequential hermaphrodites, both protandrous and protogynous, are often harem spawners. Explosive breeding is a type of promiscuity in that selection of spawning partners is random and based on presence in a spawning aggregation rather than individual selection. It is unique, however, in that the fish migrate to a specific site at a specific time for the specific purpose of spawning. Once at the site, a place and time that favors the distribution and survival of the spawn, intensive spawning occurs over a relatively brief period, and the spawning aggregation then disburses, often to the specific reef sites they previously occupied. The defining characteristics of this category are migration to the spawning site and the rapid and intense spawning activity. Some species of grouper, notably the Nassau grouper, Epinephelus striatus, travel to prominent reef sites year after year and engage in this type of spawning behavior. Promiscuous spawning may involve pair spawning where a pair is formed only for the immediate spawning and different pairs may form each day or even at different times on the same day. Many damselfish spawn in this manner with the male establishing a territory, courting many females, and spawning sequentially with each on the same nest site. The male defends his nest site but does not maintain an established harem of specific females. The females may spawn with several males at various nest sites over the spawning season. Male grammas and dottybacks also establish a nest site, a small hole or crevice in the reef, and entice various females to enter the nest and deposit eggs. The females may be less promiscuous than males in some species, choosing to always, or most frequently, spawn with the same male. Schooling pelagic egg spawners, wrasses, surgeon fish, and are also promiscuous since they spawn from schools in pairs or small groups and these pairs and groups are apparently madeup various individuals at each spawning event. Spawning activity may take place daily or at least frequently over the weeks or months of the spawning season. Lek spawning is a term used mostly for some birds and mammals to describe a reproductive behavior in which males gather at a specific location and engage in competitive displays to attract and then mate with females who also come to this location for mating. In a lek, the strongest, most competitive, and most desirable males (in the opinion of the females), secure the best locations and attract and mate with the most females. The reproductive behavior of some species of fish, some labrids, acanthurids and pomacentrids, may fit into this description of lek spawning, but it is a distinction that is more important to ethologists (behavioral scientists) than marine aquarists. Thrasher (1984) prefers the term lek-like since there is some controversy as to whether the term “lek” really applies to fish behavior and I would agree with his analysis. Andrews, et. al. (1996) recently studied the reproductive behavior of the concha wrasse, Nelabrichthys ornatus, at the islands ofTristian da Cunha in the South Atlantic. They felt that the reproductive behavior of the concha wrasse could be considered lekking, even though it was “difficult to estimate the relative influences that males and females have on mating site selection”. Andrew, T. G., C. D. Buxton, T. Hecht. 1996. Aspects of the reproductive biology of the concha wrasse, Nelabrichus ornatus, at Tristan da Cunha. Envir. Biol. Of Fishes, 46: 139–149. Thresher, R. E., 1984. Reproduction in Reef Fishes. T. F. H. Publications, Neptune City, NJ. 399 pp.